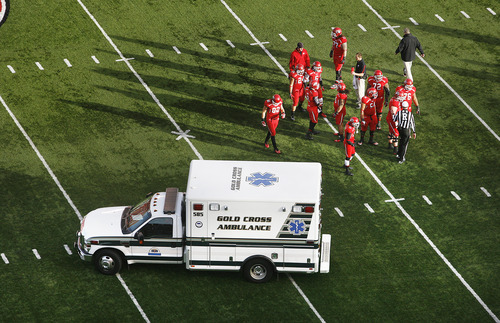 Scott Sommerdorf | The Salt Lake Tribune Utah players watch as an ambulance carrying team mate OL Sam Brenner leaves the field after the beginning of the second half. Colorado held a 10-0 lead over Utah at the half, Friday, November 25, 2011. Ambulances speeding to hospitals at the University of Utah will now face a commuter&apos;s dream: green lights all the way  every time. The Utah Department of Transportation announced Tuesday that it has completed installing "Opticom" devices at 35 intersections on major routes through Salt Lake City to those hospitals, which now allow ambulances and other emergency vehicles to switch the lights to green. Emitters allow drivers to "transmit a pulse of [infrared] light to a device on the traffic signal mast arm," said Peter Jager, a UDOT traffic signal engineer. It triggers the signals to "cycle to yellow and red to provide a green light for the approaching ambulance." "It decreases the time for us to clear an intersection, getting our patient to a hospital safely," said Chris Delamare, of Gold Cross ambulance. Jager added that it "improves safety both for the ambulance and the traveling public." Troy Madsen, an emergency-room doctor at University Hospital, says it will save lives. "Minutes and seconds can save lives," he said, especially in cases of trauma, stroke and heart attack. "I personally can think of several cases I have had over the past few years where I feel if we had gotten that patient to the emergency department even just a minute or two earlier, we might have been able to do something to save that person&apos;s life," he said at a news conference announcing completion of the project. Jager said Opticom devices have been used for years at other major intersections around the Salt Lake Valley and are often installed as traffic signals are upgraded. But the latest project has newly installed them on all intersections on ambulance routes between freeways and hospitals at the University of Utah. That includes along Foothill Boulevard between Interstate 80 and the university, and on a route from Interstate 15 along 600 South to 700 East to 100 South and the university. Jager said the equipment costs about $5,000 per intersection, and 35 intersections on routes to the university now have the system.